GRCC’s Library contains a great collection focused on resources for instructional use. But, if you’re like many of us, sometimes you just want to read something “fun.” Did you know that you can request leisure reading titles to be delivered from other Michigan libraries to GRCC for your use? For free? Start at GRCC’s RaiderSearch Catalog and run a [Title] search for the book, video, or CD you want. 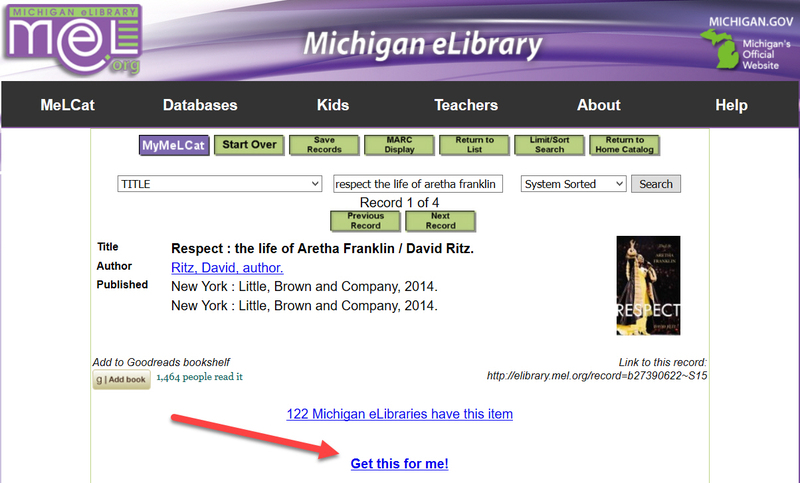 If GRCC does not own the book, then click the [Search MelCat] icon which runs the same search in the statewide MeLCat Catalog. Select your title from the MeL screen and click [Get this for me] and follow the screen prompts. You’ll be asked to logon with your last name and 7-digit Raider Number. We’ll contact you when the title arrives from the lending library. When you’re done, drop it back at GRCC’s Library and we’ll return it! It’s easy… free to GRCC… and, it will expand your reading options astronomically! Comments Off on Love to Read? September 18th is the First International Read an E-Book Day! Have you been yearning for a great new book to read? Take Thursday, September 18th as an opportunity to treat yourself to one! OverDrive, a large e-book distributor, has declared it to be the first-ever International Read an E-Book Day. Did you know that the GRCC Library licenses over 120,000 e-books currently? Many can be downloaded to hand-held devices, and all are available for reading on any internet-connected PC. So take advantage of this day and help us celebrate reading as it is in the modern world! With Spring Break coming up in a couple of weeks, the question is do you have books to read over vacation? Whether you are headed out of state to a nice warm beach or planning on staying here in Michigan, staying out of the cold, both options are ideal opportunities to soak in some good books! Need help narrowing down options? Below you’ll find a list of possible choices for your vacation read! We have survived the first week of classes, and now it is time to celebrate by reading! Today is National Reading Day, one of the greatest days on the calendar. Spend today reading required text or something fun. It is a wonderful excuse to sit outside with a good book and enjoy the sunshine or hide in a tent with a flashlight and read a scary story. Perhaps reading a book with your child is a fun activity for the day. As the weather gets cooler, I like to wrap myself up, sit outside if it is about 60 degrees and enjoy a good book. Though I have not read many books this past summer, currently I am ready Alan Watts’ The Book: On the Taboo Against Knowing Who You Are. It is still too early to give a review of the book but it was recommended by a friend a few years ago. One I am very excited about is the second book in a trilogy called The Twelve by Justin Cronin. My feelings are mixed about the first book, but the overall story made it intriguing enough to continue. Now that the library has lots of graphic novels, I can also read a wonderful selection chosen mostly by our Systems & Web Librarian Lisa Rabey. A few can be found here. Below is a list of books my associates and student co-workers are currently reading or have read recently. All the books can be found either here at the library or through the MeL interlibrary loan service.